Totally shocked with Max’s performance against arguably the strongest team in Hockey East last night. After the PEI game, I really never expected a gem like that. Way to go Max! I also wonder if our team played differently because of the goalie switch? may even be better if he played shane switzer. Thanks for your insight Colin. I just hope these changes are sustainable and repeatable against elite teams. I know Coach Quinn has always driven home the point that “we need to move our feet”. Hopefully it has become the way we play on a nightly basis. Really, two “great” goalies ? Prawdzik looked good but has only one game here. I do likw the fact that he is a stand up goalie and not spending 80% of the time on his knees. Oetttinger looks very non athletic and is very poor to his glove side. He was benched in favor of a player who was a third goalie walk on lat year. Not good. We tend here to vastly overrate out goalies. I have heard how great our goalies are for years. How many have been regular goalies in the NHL for the past 10 years ? None. If we “overrated” Oettinger than everyone else did too. I seem to remember that NHL Central Scouting Services had him ranked the #1 goalie in last year’s draft. I highly doubt they were wrong. Jake was givin the night off. By coach not benched. That being said I’m sure he wants to play every game. I liked a 4-0 game max played. The players and coaches liked Max’s game so yes I’m saying two great goalies. As I said before jake is fundamentally sound he has no weaknesses. All goalies even ken Dryden would let up goals if hung out to dry the way jake has been. Let’s not look for controversy where it does not exist, let’s be happy of our efforts on Saturday and the hope this team is starting something special. Go bu? I agree on our goalie situation. I am thinking that putting Greenway and Tkachuk together on the first line will be the key to creating an offensive juggernaut. Glenn I like that move as well. I also like the fact that with tkachuck down low in the goalies grill Greenway can get to loose pucks that squeak into the slot. They also compliment each other’s game very well. Opposing defenses will be punished by there forecheck. One other thing the play of Fabro and krys have been huge this year. I honestly believe this team is making strides forward I also believe we have a long way to go before we are the team we want to be. ? Colin (or anyone else) … have 18 and 27 played any other games together (on the same line) this season? I can’t seem to remember. Anyway, it sure seems the best way to maximize the return on their collective size and strength. Too many here are to close to the situation to see the ability of the BU goalie. He is VERY slow to react. He was benched for the number two after being PULLED the night before. agree SOCC! Jake is a mess, mentally and in goal. Constantly on his knees is right!! Ridiculous. And agree again, we have not had an A+ goalie in YEARS!! WIth that said, I think the team played MUCH better fior Max than they have for Jake. The D stepped it up and they weren’t trying to make too many pretty passes. Let’s hope they keep it going this weekend! I think one reason why coach is hesitant to put them on the same line is he likes some balance on his lines. There are strong arguments on both sides, but as of now I like them together with Jordan in the middle. Our 3 line played great Saturday and our 4 line did not play much but when they did they played well. So as long as that continues I say keep those guys together.? I love how people rush to this blog to knock players coaches other fans of this program. 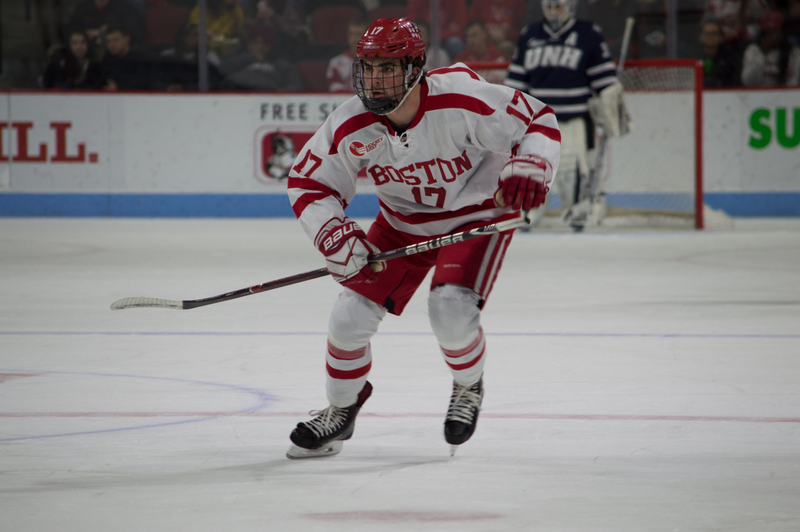 This is a BU hockey blog, perhaps the bc eagles blog would appreciate your insight on jake and his glove side weakness?. I know a little something about this kid. He is the best goalie in college hockey. He is a great teammate, he works as hard as anyone I have ever met in the game. Folks last year rushed to this website to knock him and plead to pull him, and what did jake do he took them to the NCAA regionals as one of the best goalies in the country. If you think putting fictitious weaknesses on this blog will bother jake your wrong it will only make him more determined if he takes the time to read your comments. it’s me who it upsets because I’m a die hard fan and will defend the players of this team from some of the crap thrown around on this blog. Go bu? Greenway is and has been a no show for three seasons now. He needs to go. Greenway’s year-by-year production indicates he has been anything but a no-show. Jake is the best college goalie I have ever seen so going back and forth with those who only want to tear this team down is not worth it. I will name some great goalies starting with O’Connor , Milan, fields, curry, and my favorite goalie John Bradley loved his work ethic and the way he competed. As for greenway this kid can’t get a break. If your looking for a guy who will go end to end he’s not your guy. Jordan goes to the dirty areas ticks off opposing players dishes out punishment that’s his game and he is doing great. That is all looking for two good games this week. Go bu?